Takin' it to the Hoop is a sports game that was also released in Japan as USA Pro Basketball. It supports 1-2 players and you can choose either Tournament, League or Exhibition modes. There's some nice options available as you can swap out players based on their individual characteristics and even select the type of defense you want to play. The game clearly takes inspiration from Double Dribble (1987, NES) and features some awesome court-level angles when you take a free throw or attempt a slam dunk and they're fairly well animated. The dunk sequences are fully interactive as you need to release the button once the meter reaches the red zone to pull off the slam. The best part is that you can play defense when your opponent goes for a dunk and it's exhilarating when the action zooms in and you manage to swat the ball away with a correctly timed button press! That's where the positives end though as the rest of the game is boring and a chore to play. Firstly, the controls are unresponsive and it's tricky to select a player; most of the time the game ignored my commands and I had to let go of the d-pad for it to register anything. Your teammates are absolutely useless and prefer to stand around and wait for you to take control of them rather than trying to defend. Each quarter lasts a lifetime and there's no way to change the time period length. The music is atrocious and starts skipping at times (as if the SFX interrupt the individual sound channels of the track) and there's no way to turn it off in the menus. To top things off there's even some humorous typos that flash up during a match including the phrase 'Back Cort'. 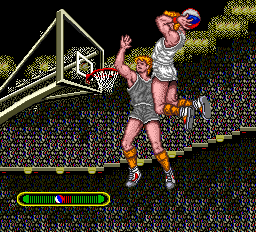 Takin' it to the Hoop has lots of nice features but they're redundant due to the dull gameplay and awful controls. It's just unfortunate that it's one of the only basketball games on the Turbografx-16 and probably the best! Random trivia: This North American version of the game is much easier than its Japanese counterpart called USA Pro Basketball as the computer A.I. was dramatically dumbed down.